How you check your body measurement? This is the measurement guide for all the fashion lover. Do you have any bad experiences buying clothing online? Yes, especially when you received the items that unfit your size. A lot online shopper are feeling happy when they saw something their like online and make a purchase on it. They are so excited during waiting the items arrive to the door step. When the items arrived to the door, the feeling even more than before and can't wait any more to try out the items purchased. How your feels if you are in the situation like this? -What if the seller is far from your place? You will waste time or money for the exchange. -What if the sizes you wanted is sold out during the time? You only can force yourself to get other items that you not really wish to. -What if you really need the cloth for tomorrow event? You can't make it on time for exchange. Do you know you can avoid this situation comes to you? To avoid this situation, you can try to use our measurement guide, this guide will guide you step by step on how to measure your body and compare with the measurement provided in the product description. Step 2: Measure your body part by part and write down on the paper you have already prepare. Bust, Waist, Hips is the most important part you need to measure. It will too loose, tight or even can't fit into your body if the measurement different so much with the measurement provided in the product description. For the third is the Hem if you are buying a fitted or bandage design clothing. If you fit the above measurement, the others will not giving you much problem except you are having an unregularly body size. 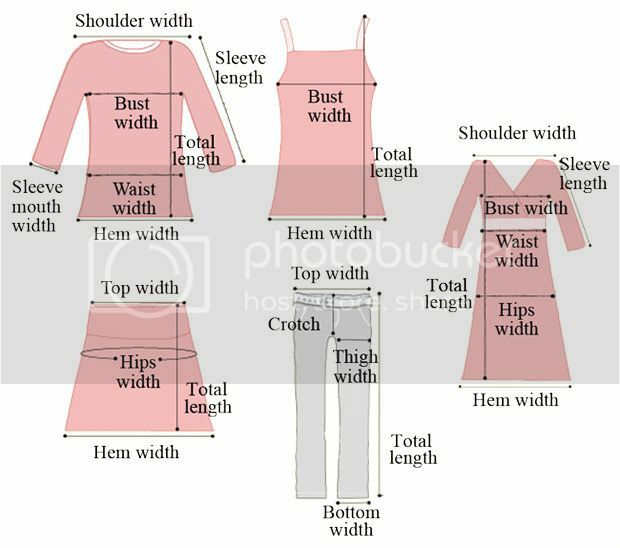 If you are having an unregularly body size, you need to measure up all the part that the picture provided and compare with the measurement provided. 1) The best way is to measure the clothing you already had and fit you well. 2) Always buy with the seller that have ready stock not pre-order, this is important because the pre-order seller did not know the actual measurement. They only provide the measure given by supplier not from actual items.